When it approved the framework on 15 June, the Board also approved the 12 strategic KPIs. The Secretariat will develop the implementation KPIs and the thematic reporting elements in the coming months. The new KPI framework comes after months of discussions about the efficacy of the Fund’s performance monitoring process, and a finding by the Office of the Inspector General that the current framework was “ineffective” (see GFO article). According to Board documents, the new framework has been developed following “significant inputs from Board constituents and technical partners.” The new framework has fewer but more focused KPIs. It uses visible and measureable indicators and will be supported by regular reporting of performance data. Previous KPI frameworks have been criticized for not reflecting the challenges posed by the Fund’s strategy or allowing corrective action when it is found necessary. The last set of KPI’s was only adopted halfway through the 2012-2016 Strategy. Even then, they were found by the OIG to be poorly designed, and not a good measure of the impact the Fund was having in the countries it supports. Approval of the new KPI framework was scheduled for the 35th Board meeting, but was delayed because some Board members asked for more time to consider what was being proposed. The delay also gave the Secretariat time to make a few revisions. One reason for the three-tiered framework is that many people believed that the strategic KPIs should not be the only tool for monitoring the Fund’s progress towards meeting its strategic goals. Under the new framework, the strategic KPIs are the top level of a broader performance management framework. 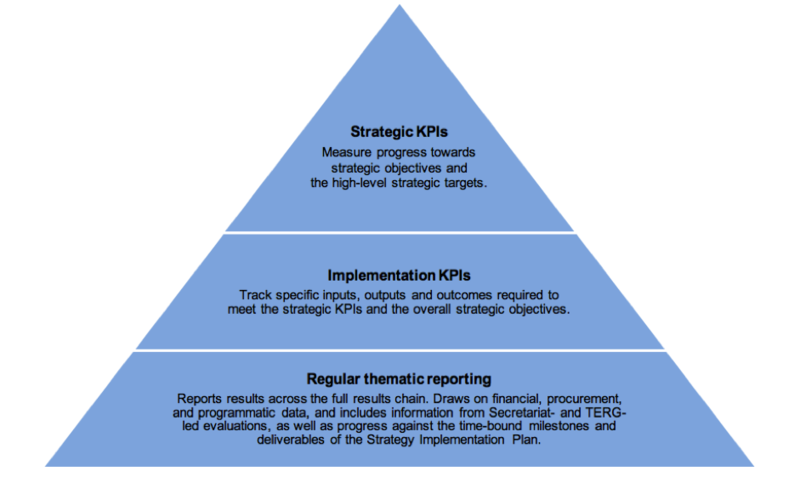 While the 12 KPIs will measure how well the Fund is achieving its strategic objectives, the implementation KPIs will “track specific inputs, outputs and outcomes” needed to meet those objectives; and the thematic reporting will provide results across the full results chain, drawing on financial, procurement, and programmatic data. The Board has been told this structure will provide it with the data it needs to better understand KPI results. Having difficulty understanding the results was a criticism voiced frequently with respect to the current KPI framework. The paper presented to the Board on the new KPIs explains that the strategic shift away from “delivering specific project-level outputs” in favor of “achieving high-level impact and ending the three epidemics” makes accountability for results more complex. One of the issues noted is that the Global Fund is but one partner among many working to the stated aims. The use of the third tier – thematic reporting – is intended to help address this issue. Other data-related challenges in the paper included the unavailability of quality data, issues related to reporting frequency, and the time lag involved in being able to ascertain measurable effects. To address these challenges, the Fund will need to invest in data collection and processing systems. A plan to put this in place will be developed this year, but the Board has been warned that the data needed to measure some KPIs – particularly those that track change over time – may only be available in as many as three years from now. It is important to remember that so far the Board has only approved the new KPI framework. Full details of what data will have to captured to adequately measure the Fund’s performance are not yet available. Now that the framework has been approved, the Secretariat will move on to developing the methodology, indicator baselines, and analysis needed to set actual targets. These will be submitted to the Board for approval at its last in-person meeting of 2016. For a description of each of the 12 new strategic KPIs, see separate article in this issue.